A week ago, Alexander van der Zwaan was sentenced to 30 days in prison and a $20,000 fine for lying in the Mueller investigation. In light of the current events engulfing Trump consigliere Michael Cohen, there is an air of prefiguration around the fact that the first person actually to go to jail for his involvement is a lawyer. But van der Zwaan and Cohen are just two of the seeming legion of lawyers arrayed on all sides of the conflict.The Trump administration's legal troubles have made MSNBC-watching-household names out of many lawyers, some in relatively obscure positions (Rachel Brand, anyone? How about Noel Francisco?). It's not easy to keep track of them all. Herewith, the first page of an adult coloring book, "The Lawyers of Trump-Russia." The soothing benefits of adult coloring have been widely touted, and while coloring in a picture of the first person to go to jail in the Trump-Russia scandal cannot be guaranteed to put you in a meditative state, it might at least provide a few minutes of fun and a reminder of one of the bit players in the unfolding legal drama that is the Trump Administration, the Mueller investigation, and all related criminal proceedings. Because van der Zwaan did not cooperate with the Mueller investigation, even after his lies were discovered, we may never know the full extent of his involvement. Even the sentencing judge, Judge Amy Berman Jackson of the federal District Court for the District of Columbia, conceded that she did not fully understand his motives. What we do know is that, as far back as 2012, van der Zwaan's work at the London office of Skadden, Arps, Slate, Meagher & Flom, a major New York law firm, included a project involving Paul Manafort and Rick Gates. He was involved in the preparation of "a report used to defend their client Viktor F. Yanukovych, the pro-Russia former president of Ukraine, from international criticism over the prosecution and imprisonment of a political rival," Yulia Tymoshenko. The report examined the legal basis for criminal charges against Tymoshenko, a two-time former prime minister of Ukraine. Later, van der Zwaan was in communication with Gates and Konstantin Kilimnik, sometimes called Manafort's "man in Kiev." It was his "pattern of concealment" about those communications that led to his conviction. 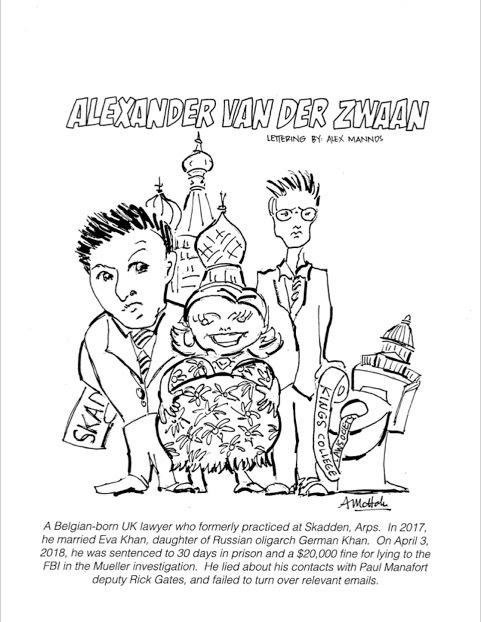 In 2016, van der Zwaan met Eva Khan, daughter of Russian oligarch German Khan. Khan, now worth about $9.5 billion, is mentioned in the notorious "Steele dossier." Alfa Bank, which Khan heads, is alleged to have been involved in Russian efforts to influence the 2016 U.S. presidential election. Khan and others sued Fusion GPS and Buzzfeed in 2017 over the dossier's release. Van der Zwaan and Eva got married on June 23, 2017 (check #khanderzwaan for the wedding pix! ), and she is currently expecting their first child. Does the adage "A chain is no stronger than its weakest link" apply to a major law firm?